Rebel Yell On Line is a web store for Southern Heritage and History lovers brought to you by the same kind of people. This is more than a business for us. It is a calling. We are located in Georgia and are very active in the Southern Heritage community, having devoted many hours and days to protesting the removal of the 1956 Georgia State Flag in 2002 and trying to get a vote. We have protested heritage violations all over Georgia with a group of compatriots called "flaggers". Our goal in creating this site is to have some fun and offer some unique items, ideas and concepts, such as: Rebel Yell clothing; Confederate Flag Bikinis, Rebel Flag Bikinis, Men's Confederate Flag Swimsuits, Southern Gift Baskets appropriate for Christmas and Holidays, Redneck T-Shirts, Confederate Flags, Southern Heritage cookbooks in living color with sumptuous recipes, Confederate flags, and much more. 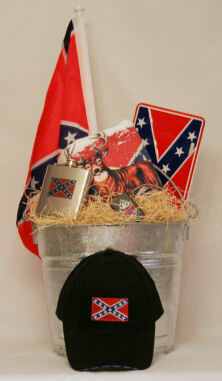 Our gift basket line is an original creation sure to delight Southern Heritage lovers all over the world. The "Redneck Starter Kit" is chock full of everything you need to get your Redneck on. We have nine (9) different gift baskets: Redneck Starter Kit, Rebel with a Cause, Rebel Gramps, Rebel Granny, Redneck Mama, Rebelicious in the Sun, Confederate Cook, Southern Belle and Dixie Darlin'. Most of them are in very nice galvanized pail containers. The perfect gift basket for those who are tired of the same old food (Spam), wine, (Georgia has quite a few vineyards, but we don't consider wine a Rebel libation), beer or Christmas and Holiday Gift Baskets. We have that just right basket idea for you. Click on the Baskets Button. Our rustic one of a kind hand crafted Confederate Flag Bird houses are totally great. As birdwatchers, we a beautiful bird house that will hold up. These were made by a couple in 'Bama. He says when they do a show up North, the Yankees buy them up immediately. We have a Mini and a Standard. Unfortunately these are now collectors items in very limited supply. The craftsman has hung up his hammer and can't be cajoled back into business. There is also a great collection of merchandise featuring the Confederate Flag (sometimes called the Southern Rebel Flag), two excellent Southern Heritage Cookbooks, straight from the Gone With the Wind era. We also carry Confederate Flag jewelry for him and her. Please visit all of our product pages to see what unique fun gifts, basic Southern stuff and great merchandise is available from Rebel Yell On Line! Southern living at home or away. We have Confederate Flag Bikinis, Rebel Flag Bikinis, Men's Confederate Flag Swimsuits in all sizes. Please see our Southern Heritage Page for a short list of our favorite Heritage Websites, books and e-mail newsletters. We also have a few of our favorite recipes for your pleasure on our Misc. page. You will find us providing good service and doing everything in our power to defend Southern Heritage and have a good time doing it. You will enjoy doing business with us.